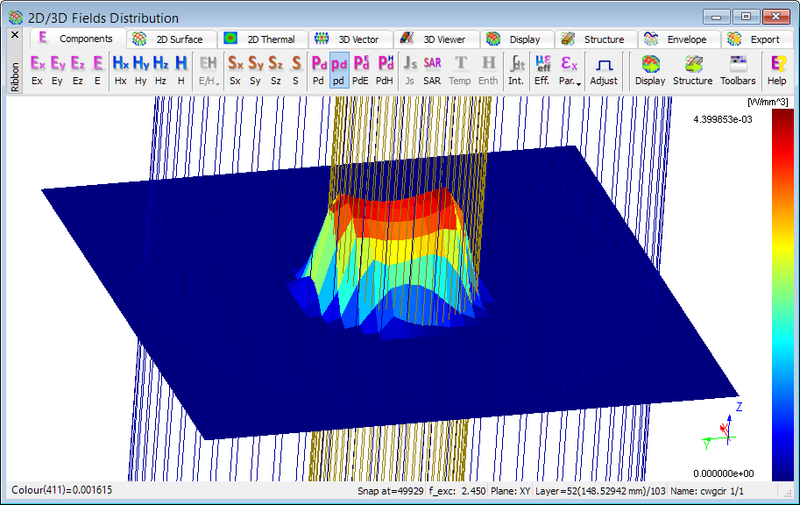 QuickWave 3D allows simulation of circuits with electric volumetric losses described by conductivity Ϭ [S/m] and with magnetic volumetric losses described by magnetic conductivity Ϭm [Ω/m]. It also applies a surface loss model in the case of metals characterised by large but finite conductivity Ϭ [S/m]. The power dissipated in a cell is calculated from the electric and magnetic field components staggered in space by averaging. 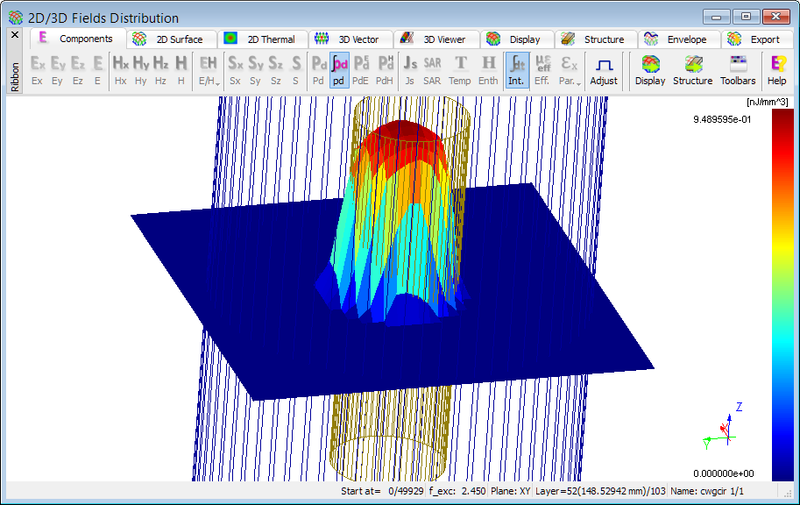 Software calculates dissipated electric power (PdE) from the electric field components, where k, m, l stand for cell indexes. 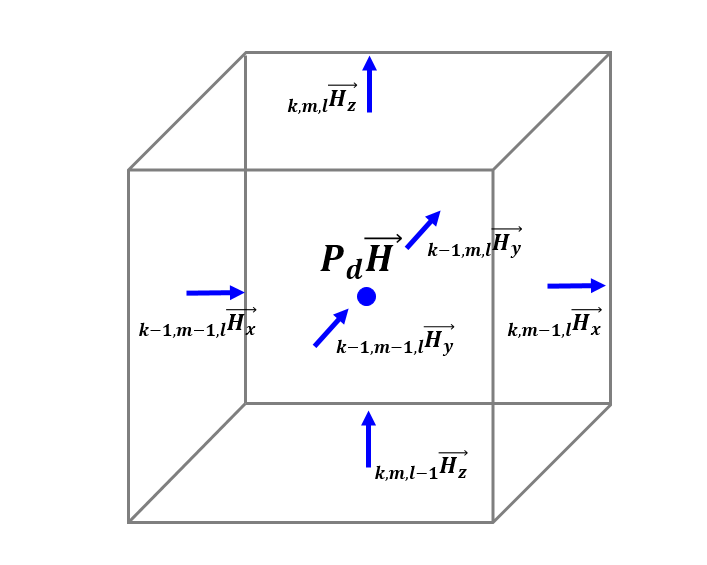 The dissipated magnetic power (PdH) is calculated from the magnetic field components (k, m, l stand for cell indexes). The total dissipated power is calculated as a sum of dissipated electric power and dissipated magnetic power (from the field components). Power dissipated in each FDTD cell is averaged from several field components - but also each field component contributes to dissipated power and energy in more than one cell. The FDTD algorithm naturally produces dissipated power and energy associated with a particular field component and its surrounding volume. In QuickWave, the power is subsequently distributed among cells sharing these field components proportionally to relative dimensions of such cell, and their relative conductivities. 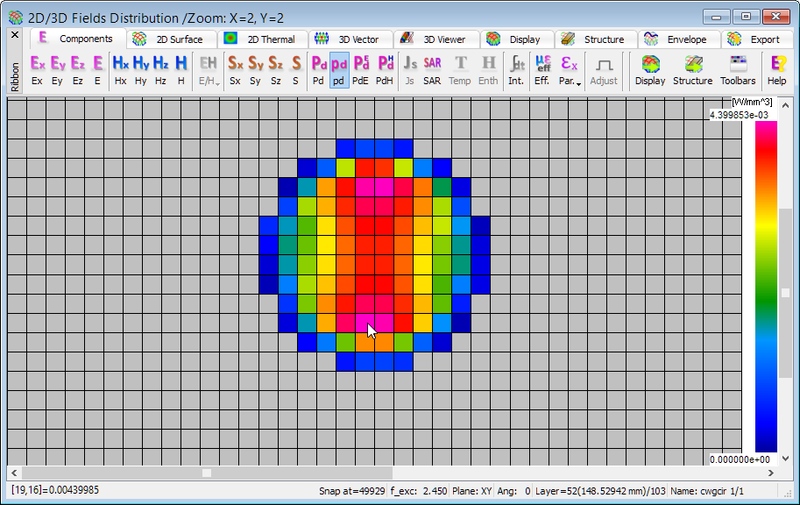 Power portions assigned to metal cells (PEC or metallic) are zero. QuickWave allows monitoring the dissipated power (total, electric, magnetic) and dissipated power density along any line parallel to one of coordinate axes or in a particular point of the circuit versus time. The 1D monitoring delivers instantaneous and envelope (time-maxima) values of the chosen quantity and is available in 1D Fields window. QuickWave delivers also the time-dependent 2D distribution of the dissipated power (total, electric, magnetic) and dissipated power density in the circuit, are available for every FDTD layer along each of three axes. 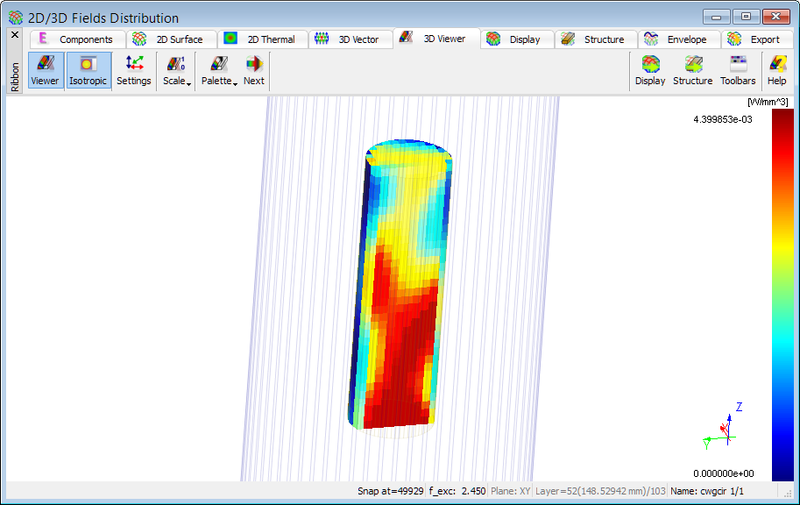 The distributions of the above quantities are available in 2D/3D Fields Distribution window, which offers several different options for adjusting the distribution display to the user�s needs (e.g. display type, scales, etc.). Dissipated power is calculated in [W]. 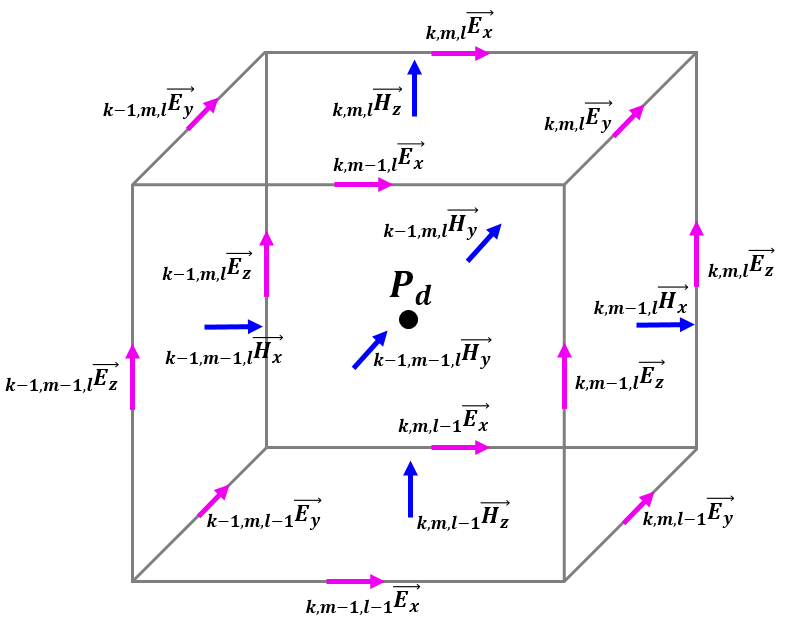 Dissipated power density equals to dissipated power divided by the volume of cell, thus its unit is [W/mm3]. The numerical value of dissipated power (total, electric, magnetic) and dissipated power density within each FDTD cell can be read in Thermal mode of display. The left part of the status bar displays information about field value in the FDTD cell pointed with mouse cursor. The 2D distribution display in 2D/3D Fields Distribution window allows primarily monitoring the instantaneous values of dissipated power. 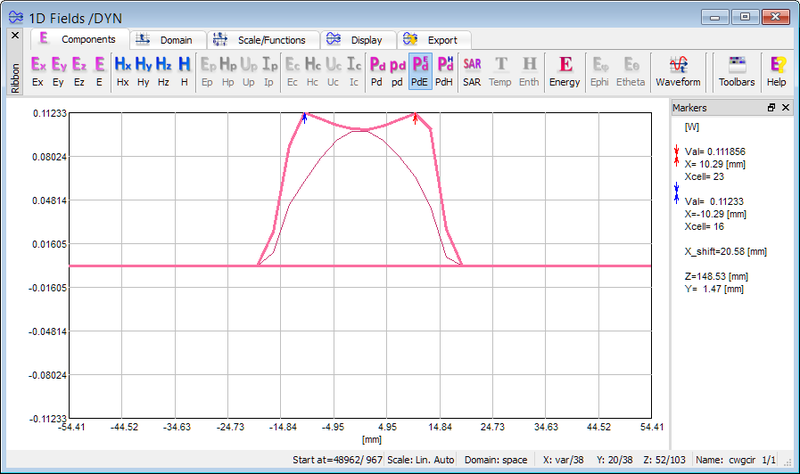 Time-maximum of power dissipated in each cell can be found by switching to Envelope Max option. In many applications, such as microwave heating, average power dissipated in a sinusoidally-excited circuit is of interest to the user and the distribution of average dissipated power can be enabled with Envelope Avr option. The time-dependent dissipated power and dissipated power density distribution can be also viewed as Viewer 3D display. This feature is enabled in the 2D/3D Fields Distribution window and allows watching the instantaneous, time-maximum, and time-average values of dissipated power and dissipated power density. See also Power dissipated, energy stored and Q-factor values and online documentation about dissipated power and dissipated power density. The distribution of dissipated power and dissipated power density is physically meaningful in the steady-state sinusoidal excitation regime. However sometimes we are interested in the distribution of the total power dissipated when the circuit is excited by a pulse of limited duration. This will be a distribution of the time integral of dissipated power (dissipated power density), thus the distribution of the total energy converted into heat during the simulated process. 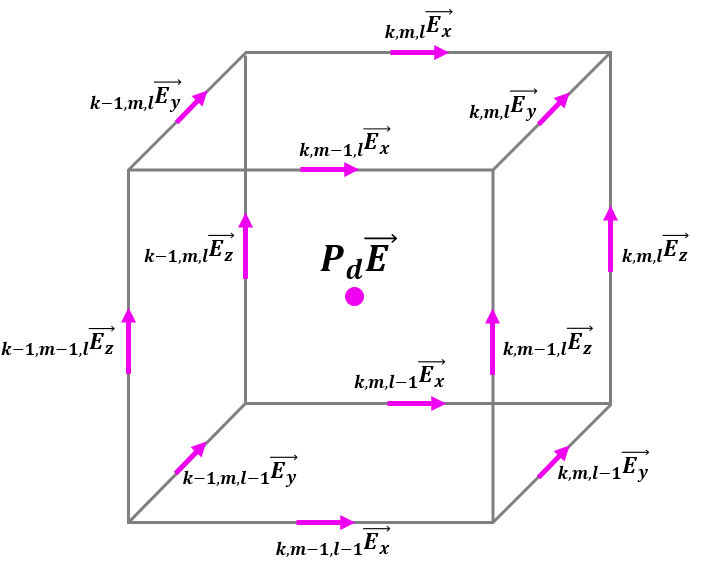 The distribution of the time integral of dissipated power (∫Pd), dissipated power density (∫pd), dissipated electric power (∫PdE), and dissipated magnetic power (∫PdH) are available in the 2D/3D Fields tab or 2D/3D Fields Distribution window. Invoking this option starts the time integration of the chosen quantity in each FDTD cell at each time-step. See also Time integral of power dissipated and online documentation about dissipated power and dissipated power density.